By Tom Kertscher on Friday, January 16th, 2015 at 3:35 p.m.
Gov. Scott Walker spoke to fifth-grade students at Ronald Reagan Elementary School in New Berlin, a suburb of Milwaukee, on Feb. 6, 2014. Abruptly and unmistakably, Gov. Scott Walker stated a position on what nationally had become a contentious issue among conservatives: the Common Core education standards. "Today, I call on the members of the state Legislature to pass a bill in early January (2015) to repeal Common Core and replace it with standards set by people in Wisconsin." Previously, Walker’s position had not been so stark. Later, after his State of the State speech on Jan. 13, 2015, it became even less clear. All as Walker embarks on a second term and, increasingly, captures attention as a potential 2016 candidate for The White House. 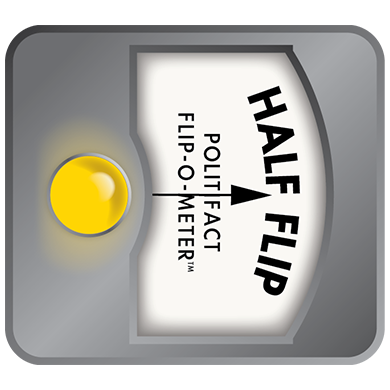 So has Walker has done any sort of flip-flop on Common Core? As we turn to our Flip-O-Meter, it’s important to note we’re not making a value judgment about changing a position. Rather, we are looking at whether Walker has been consistent in his stance, or changed it. Some argue a change in position shows inconsistent principles or lack of backbone, others see it as pragmatism or a willingness to compromise. Common Core is a set of standards for English and math unveiled in 2010 that came out of years of discussion between private nonprofit groups and state education departments. The goal was to better prepare students for college and careers and ensure that students in different states learn the same academic concepts. The federal government has had a role in encouraging states to adopt the standards, but they are voluntary. Walker gave a nod to Common Core in his first state budget, which became law in June 2011. It directed Evers’ Department of Public Instruction to come up with a new statewide test for school children, and that test would have to "measure mastery" of the Common Core standards. Seven months later, in January 2012, a report was issued by the state Read to Lead Task Force, which was formed by Walker and Evers, and chaired by Walker. The report made recommendations on improving children’s reading. It noted Wisconsin was among the first states to adopt the Common Core standards, which it called "rigorous." And one of the recommendations was to ensure that the state’s early learning standards aligned with Common Core. In April 2013, Alan J. Borsuk, an education fellow at Marquette University, observed in a Milwaukee Journal Sentinel commentary that nearly three years after its adoption in Wisconsin, Common Core was little known outside of education circles. Walker "has been low key in his support, but nonetheless has been on board," Borsuk wrote. "Implementation is one of the things that Walker and Evers have cooperated on. There is criticism and opposition, but it has been pretty low volume." So, Walker showed tacit support for Common Core during most of his first term. Walker’s second state budget became law in June 2013. It prohibited the Department of Public Instruction from "directing school districts" to do further implementation of Common Core. But Common Core standards adopted by the state superintendent to that point remained in effect. Seven months later, in January 2014, Walker went further. In a speech at the State Education Convention, the governor said he was working on legislation to create a commission (to be chaired by Evers) to revisit the Common Core standards. Walker said they weren't high enough and were being dictated by people who weren't from Wisconsin, when they should be "driven by people in Wisconsin." Then six months after his speech -- and facing a formidable challenge from Democrat Mary Burke in his bid for re-election -- Walker issued his out-of-the-blue July 2014 news release calling for Common Core to be repealed (a stance he later reiterated). "The declaration comes after months of virtually no public debate among Wisconsin lawmakers on the standards," a Milwaukee Journal Sentinel news article reported. "Earlier this year, a proposal in the Legislature to undo them went nowhere, with Walker saying little." Borsuk, of Marquette, wrote: "The one-sentence news release issued by Walker symbolized how little this controversy has to do with serious work on specific aims for children's education and how much this is about politics and appealing to blocs of voters as the November (2014) election approaches." As definitive as Walker’s position had seemed to become, it would shift again. On Jan. 5, 2015, the day of Walker’s inauguration for his second term, The Daily Caller published comments from Laurel Patrick, the governor’s press secretary. She spoke of repealing Common Core -- but of something less than that, as well. "As he works to continue transforming education, Gov. Walker will work with the Legislature on an education reform bill that includes accountability for all schools receiving state funds, as well as a repeal of Common Core," Patrick was quoted as saying. But she added: "The bottom line is he wants to make sure that no school district in the state is required to use the Common Core standards." That led Truth in American Education to accuse Walker of sending mixed signals. The group, which opposes Common Core, said "making ‘sure that no school district in the state is required to use the Common Core standards’ sounds nice, but that is an opt-out not a repeal ….Walker needs to stop saying he wants Common Core repealed, but then signal that he will settle for a weaker opt-out bill." "I call on the members of the state Legislature to pass legislation making it crystal clear that no school district in the state is required to use Common Core standards. Going forward, I want to eliminate any requirement to use Common Core." Walker hasn't explicitly advocated the Common Core education standards, but his position has varied. During most of his first term, the governor showed tacit support. By mid-2013, he was hitting the pause button on further implementation of the standards. In mid-2014, Walker called for an outright repeal. But by January 2015, he was saying only that he didn’t want school districts required to use Common Core. For a partial change of position and inconsistent statements, our rating is a Half Flip. To comment on this item, go to the Milwaukee Journal Sentinel's ​web page. Published: Friday, January 16th, 2015 at 3:35 p.m.